‘Eleanor’ and ‘Mr. Roosevelt’ were a bonded non-releasable pair of Bald Eagles that lived in a private naturally landscaped aviary with a huge nest in Eagle Mountain Sanctuary at Dollywood. 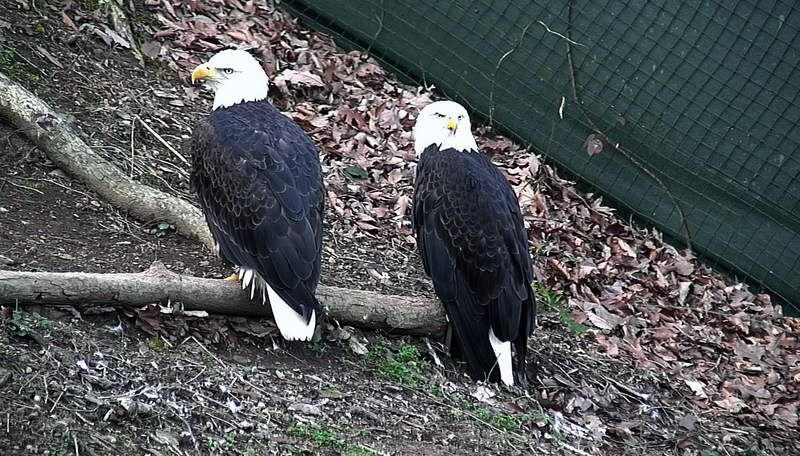 This pair bonded years after they were both transferred to the American Eagle Foundation and placed in the “Pick-A-Mate” section of Eagle Mountain Sanctuary. In 2016, the American Eagle Foundation found two eggs that were laid on the ground in Eagle Mountain Sanctuary, and the eggs were taken to the American Eagle Foundation’s incubation room. One eaglet hatched but unfortunately didn’t make it past its second week. Eleanor sustained permanent injuries which prevented her release back into the wild. The bird was admitted to the Wildlife Center of Virginia as an adult on April 16, 2007. On initial presentation, Eleanor had a large open wound on the upper portion of the left wing caused by unknown trauma. The wound healed; however, as a result of the injury there was extensive damage to the feather follicles, creating a large feather gap in the secondary feathers between the wing and the body. Eleanor was treated with a series of antibiotics and anti-inflammatory medications. She recovered well and was otherwise healthy despite her inability to fly well enough to survive in the wild. On January 17, our beloved Ellie was found deceased in the aviary compartment that she and her mate, Mr. Roosevelt, occupied. There was no apparent injury – no visible sign of trauma. She was immediately taken to the University of Tennessee School of Veterinary Medicine, where an initial necropsy was performed. All tests to date came up negative. At present, a comprehensive pathological necropsy is still being conducted and when we receive the final report, we hope to be able to provide more information. As you may well imagine, this was a devastating event for all our caregivers. We hope to give more information once the final necropsy report is released. Mr. Roosevelt will be moved into the Pick-a-Mate section in hopes that he will find another companion with whom to bond.